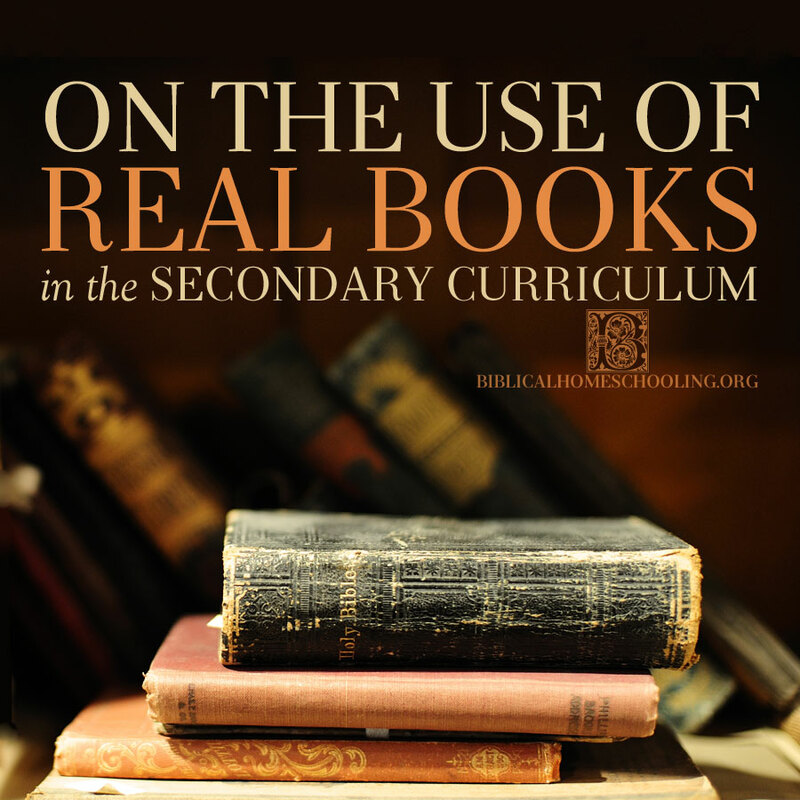 Real Books or Text Books? For example, in the dialectic and rhetoric stages, we are faced with a list of “great books” to read, like Aristotle’s Rhetoric, Cicero’s Orations, Augustine’s Confessions, or Madison, Hamilton, and Jay’s The Federalist Papers. They intimidate homeschool parents. But we can read these works successfully with our children in our homeschools. I know because we do it every day, with the greatest great book, the Bible. The Bible is a real book. It is not someone’s text book telling us what the Bible means and what its main points are. We believe we can read it for ourselves, and our children can read it for themselves, and get something out of it. If we can do that with the greatest great book, we can do it with lessor great books, and even other books that we might use that are helpful, but not “great.” What follows is the plan we use in our homeschool to get the most out of real books in our curriculum. Dialectic stage children can do the following work with parental help and prompting. It works well for parent and child to write the book notes together, especially in the beginning. Rhetoric stage children do much of this work on their own, with occasional parental help. Over the course of the six years, children will need less and less help as they get the hang of reading and evaluating real books. Begin with keeping a notebook, such as a spiral notebook, for each subject under study. Your notes and thoughts and outlines of the real books you read will be recorded in the notebook. Reserve the first page for a list of the books studied for that subject, adding to it as you progress in that study. Make each entry like an entry for a bibliography, and save a space for the date that the book is completed. This first page, in essence, becomes the “table of contents” for your individualized secondary studies in that subject. It is of great help later when compiling report cards, transcripts, or documentation records for college entrance. To get the most out of each book, read it through twice. The first time through, read the book quickly, even skimming it. This should take no more than a week for even the thickest book, and many times will only take a few days. If it takes longer than that, you are reading too intently for the first time through. The goal should be just to get the gist of what the author is saying, the big picture. You don’t want all the details yet, but just a general idea of where the book is headed–it will help later when the details might otherwise bog you down. During the first reading, record the book’s table of contents in the notebook, leaving a little space to write in each chapter’s main idea later. Be sure to read the author’s preface or introduction, if there is one, in this first reading. Good authors don’t want to be misunderstood, and many times they will tell you what message they hope to communicate by the book’s end. What the author thinks he is saying is of prime importance! Make a note of it in the notebook. Now the real work of reading begins: reading the book through the second time, this time paying attention to all the details. As you read, you will be making notes on the book, and keeping an outline of the book, chapter by chapter, in the notebook. Begin each chapter’s notes on a clean sheet of paper in the notebook (neatness always helps). 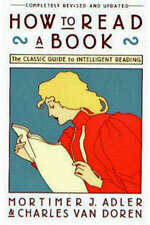 Approach each chapter as you did the entire book, giving it an initial reading. If, as you initially read the chapter, something the author says strikes you, make a note of it in the notebook. If he says something you find questionable, or don’t understand, make a note of it. If you run across vocabulary that you can’t figure out, make a note of it. If he uses a mystifying sentence construction that makes no sense, make a note of it. When you have finished that chapter’s initial reading, go back to your notes. Your goal is to understand the author’s message, so it is important to “get” whatever it was that was unclear initially. Look up vocabulary in the dictionary, and write definitions down in the notebook. Re-read the unclear paragraphs and think about them until they begin to make sense. Some convoluted sentence structures may actually have to be diagrammed in order to figure out the meaning. Remember that the main point of the sentence is contained in the subject-verb-object-indirect object, and all the prepositional phrases are window dressing. With older books especially, it may help to actually divide really long sentences into several shorter ones. Do all this work in the notebook. Make a point to record the author’s statements that you agree or disagree with. These points of contention and agreement make great starting places for high school papers. Once you understand that chapter’s message, outline the chapter. Look for the main idea of the chapter, and record it. Under the main idea, record the points the author makes to support his main idea, along with any sub-points used to support a point. Once the chapter has been outlined, finish the notes on that chapter with a one sentence thesis statement for that chapter. Remember during the quick first reading of the book, you recorded the book’s table of contents with some space left under each chapter heading? Record the chapter thesis statement there. Now you can go on to the second chapter, and so through the book. When the entire book has been outlined, carefully go through each chapter thesis statement and try to identify the over-arching thesis statement for the entire book. In one or two sentences, state the author’s thesis, or premise. In several sentences under that, state the author’s main points in coming to that premise. Rewrite the thesis statement and its supporting points as a well-constructed paragraph. Now you have a succinct, very brief synopsis of the book to use for future reference. Once you know what the author was trying to say, you can determine what you think about his message. It helps to discuss the author’s main ideas with someone, or write to someone about the book. Usually it is when discussing and writing about ideas that they begin to crystallize in our own minds. Was the author’s message true? Was it partly true and partly erroneous? Why or why not? It is not enough to just agree or disagree with the author based on some vague feeling. Prove that his message is either true or not true. Realize that our ideas about whether his message was true or not may change over time, especially if we are just beginning a study of a subject. We may want to adjust our thinking as we become more learned in the topic. This is perfectly fine. Look up Lord Acton’s quote, “Power corrupts.” Was he speaking of political power only? The context appears to indicate that he was. “What is government, and what sets it apart from all other human institutions?” –answer to this question possible chapter thesis statement. Political power: the privilege of using brute force to back up [government] decisions, unique among human institutions. Influence: implies choice, individuals can choose to walk away. Governments are the only institutions that are designed to encroach, in violation of one of the two great laws: Do all you have agreed to do, and do not encroach on other persons or their property. America’s founders believed government inherently evil because of this. ? Think about this–Biblical basis for this statement? Main idea: Political power is inherently evil. Political power is the essence of governments. a. Governments have the privilege of using brute force to back its decisions. 1. Uses force or the threat of force (military and police) to induce obedience. 2. Exercised in taxation, military conscription, participation in the Social Security system, drug use and gun ownership laws, etc. b. Brute force is political power. 1. Other human institutions are not able to use brute force to make you buy what they are selling. 2. Businesses, charities, service organizations, churches etc. may use influence, but not brute force. Political power violates one of the two great moral, or common, laws. Therefore, political power is inherently evil. Chapter Thesis Statement: Political power, uniquely exercised by governments among human institutions, is inherently evil because it uses brute force to back up its decisions, thereby violating one of the two great laws: do not encroach. Thank you for visiting and letting us know about this wonderful resource, Mr. Weismann! This is a beautiful strategy. But what do you do with a reluctant child? Or teen? I can’t seem to get mine to work at this kind of independent level or take this kind of invested interest. Hello MamaK, this teaching strategy is a progression from earlier teaching strategies in younger grade levels, and it will be difficult to implement “cold” without that earlier training. Preceding this secondary work in real books, is elementary work in real books (that article is coming). For any student transitioning from public school and/ or textbook and test type education, their grade level number should be far less of a factor than their level and ability of independent thinking. Every child should enter in to learning from real books at their ability, regardless of their grade level number, and proceed from there. Older children “catch on” amazingly quickly if they are given the chance to begin where they are instead of where someone says they ought to be. Thank you for posting this article. I am reading ‘How To Read a Book’ alongside my son and pondering how to put into practice the strategies Adler describes. Your ideas are quite helpful!